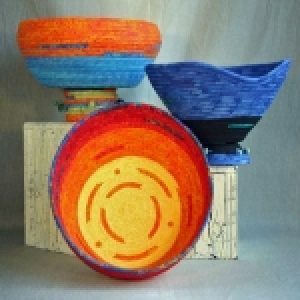 2016 Niche Award Basketry Finalist Patricia Pasteur began her career as a self-taught weaver, teaching early elementary school and showing her craft throughout the United States. Now retired on Cold Stream Pond in northern Maine, Patricia works full time creating one of a kind fabric baskets and digital artwork. The MCA is excited to welcome Patricia as a new member of the Center for Maine Craft and exhibitor at the Portland Fine Craft Show! To learn more about Patricia, visit the Center for Maine Craft or view her website.